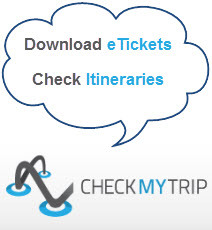 Ticket has negotiated special discounted marine travel airfares with most scheduled airlines. 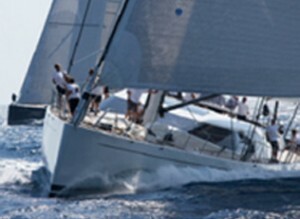 Our clients in the Yachting Industry can now benefit from these marine airfares together with all our existing deals and offers. No penalties for changes, and only a small fee for cancellations. Although marine fares are strictly controlled by carriers the eligibility for use is generally the same. This includes Captains, Engineers, Mechanics, Stewards/Stewardesses, Chefs, Technicians, Architects, Builders, Surveyors, Brokers, Management, Company Trainers, etc. Contractors who are travelling to carry out work on a vessel are also eligible, as long as they are going to join the vessel for the purpose of work. Spouses and families may also be eligible on some airlines. 1. A letter on company/yacht letterhead outlining the need to travel. This needs to include the Passenger Name, Name of Vessel and the Port of Registry. This does not need to be a complicated letter but we strongly recommend that a letter is always carried regardless of airline being used. 2. A Seaman’s log book. 3. A Company contract showing the details of employment and the embarkation port. Airlines do occasionally audit passengers at check-in for the misuse of marine fares. It is the responsibility of our customers to ensure that the passenger carries the correct documentation. 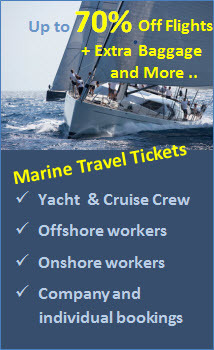 The marine travel tickets from Ticket are available to almost every worldwide destination and we have assisted many travellers and companies to reduce their costs and be totally flexible with their travel arrangements. Contact us with your requirements and we will be happy to advise. – Search our live database for the cheapest car hire rates available around the world from our international and local partners. – Book your travel insurance online immediately – available even if you have not booked your travel tickets with us. – Contact us for any other travel related services – from corporate travel and business flights to vacations and ferry bookings around the Med.